Save on Shipping with local store pickup. Order Online and choose Check at checkout then pay only for the goods upon receiving them. 150 lb. Weight Stack Add-On Kit takes the standard weight stack to a new level of performance. Add 150 lbs. 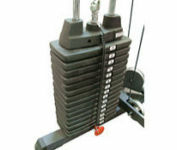 of resistance and the convenience of weight stack selection. Fast and simple installation make this a must-have for selected Body Solid and Powerline plate load systems that accept this attachment (sold separately). Includes fifteen 10 lb. plates and selector pin. NOTE: Must be used with a Body-Solid or Powerline home gym that accepts this attachment.